So first off, I've got a giveaway going for you that involves winning a $40 gift voucher to InDressMe! They're an online site with some amazing stuff, guys. Just check out a few of my favorites from there. Now, on to the outfit part! This is what I wore for classes last Friday (yeah, this was a while ago, sorry!). I got quite a few compliments on both my scarf and studded flats. What I love about these slippers is how they don't leave blisters on my heel. A lot of flats do that to me after a full day of walking around. Thankfully, these are well-made and are mercifully comfortable all day long. There was this one embarrassing moment though. 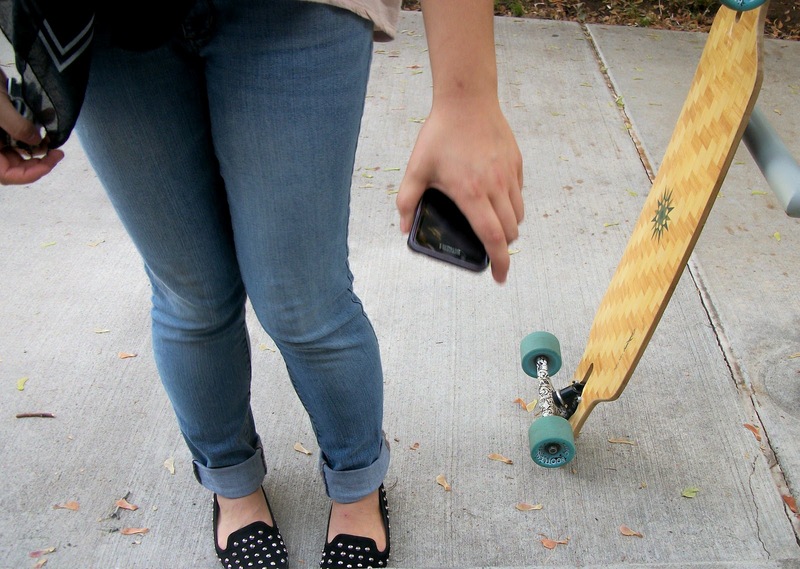 Haha, so I put too much weight on my back leg, which made the board slip out from under my feet and go flying across the sidewalk into the grass. I went after it and picked it up, and right as I stand, this guy on his longboard goes pushing past and kind of smirks at me before saying "Hey." Mild moment of embarrassment. Aha, oh well, I know I just need to keep spending time working on it. I'll get it eventually - I'm determined to pick this up! 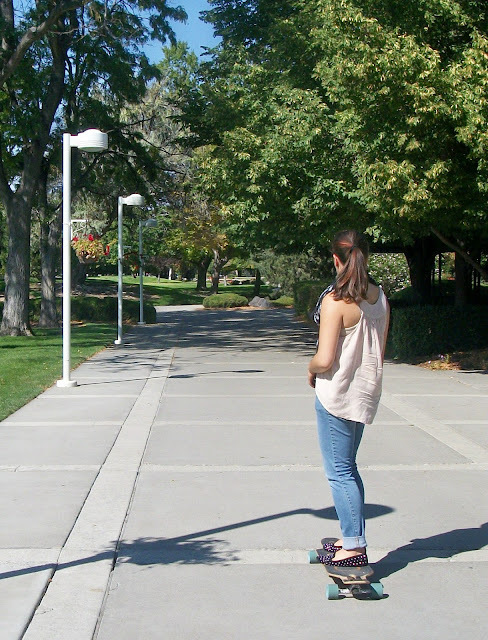 Patrick gave me some links on where I could check out longboard reviews and watch videos on the different kinds, so I've been doing a little research. Naturally, the one I want is one of the more expensive ones. Sigh. Its actually the same brand as this one that I'm borrowing. Patrick's being really sweet though and told me I could use his for this semester since he has another one. Yay! A photo session for a wedding was taking place in the background in case you're wondering. So college has been testing my procrastinating ways. I really need to get a handle on that bad habit. My excuse however, is that I work better under pressure. I really can not focus on my work until I feel that time crunch. Then I can whip out exactly what I need and stay zeroed in on what I've got to do. In other college updates, I've fallen into a love/hate relationship with my dance class. I get intimidated from all the dance majors that are in there, which makes me lock up and not move as smoothly. Its incredibly difficult to let go of inhibitions when I have no clue what I'm doing, and it looks like everyone else does! Luckily, I've met two other girls who are new to dancing like me, so we like to stick together throughout the drills. While it's frustrating, there are moments where I truly enjoy the dance sequences we're learning. Some of the dance moves feel so good and freeing. Our instructor even praised me today, when I thought no one was looking. Aha, she was walking us through this one movement and I was imitating it to practice, and all of sudden I hear: "Yes! Exactly like that, that was beautiful Linda." I'm hoping by the end of this semester I'll at least be able to move more smoothly and gracefully. You have no idea how incredible some of the other girls in my class are. They move as if they're living art. There are those awesome flats again! So awesome to see you long boarding! And it doesn't surprise me that you got so many compliments, both your scarf and flats are fantastic! Also, your jeans fit SO well! I'm really jealous. I just entered! I'm so excited! I love your outfit too, the skull scarf is so cool! Thanks ir the comment on my diy- I knocked up a studded pair last night in about an hour too! omg awesome outfit! love it! you look very cool and fun! Adore your shoes and thanks on advising this shop! It's very cool! I really like this outfit and the first photo of you is my favourite. those studded loafers make such a cool combo with the skull print scarf and the pink'ish top adds this feminine side at the same time. good luck with your studies (all of them ;), btw! i totally didn't expect the scarf to be from hot topic.. it looks very alexander mcqueen-esque. anyway you look great.. jealous of the studded slipper loafer shoes.. you're simply fantastic! And the outfit looks great, especially love the scarf! I love this look! The shoes are so cool! Looks like fun! I wish I was brave enough to try! ;) I was gonna take a Dances of Africa class last semester--how cool would that be?! Does your school offer a class like that? 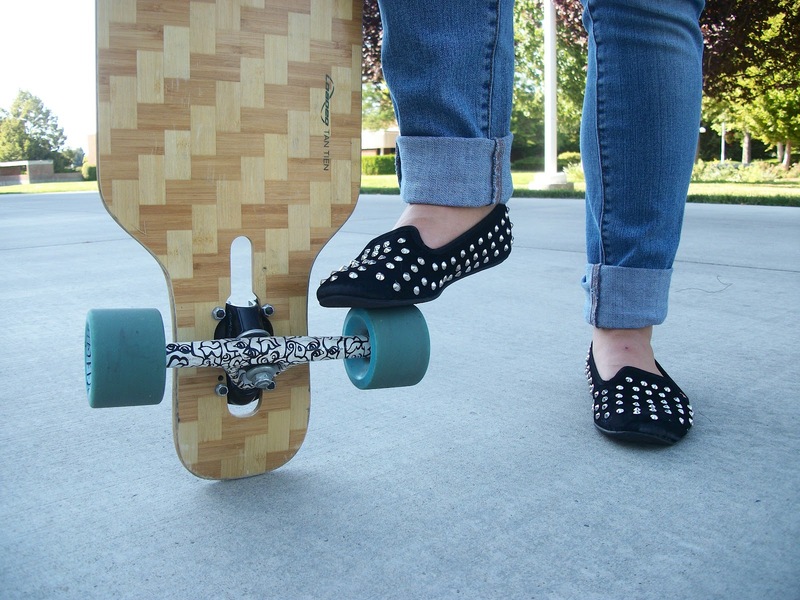 so fun and cute linda :) love studded flats, glad to hear they are comfy :) and good for you learning how to longboard. I wish i could :) would have been very helpful while at college too!!! Love that pretty scarf & those flats are so FAB....you're chic for school!! 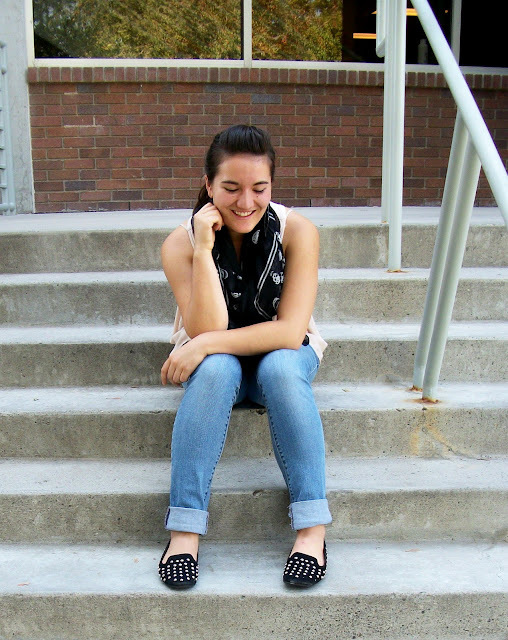 those flats and scraf are the best part of this outfit, great outfit!!! 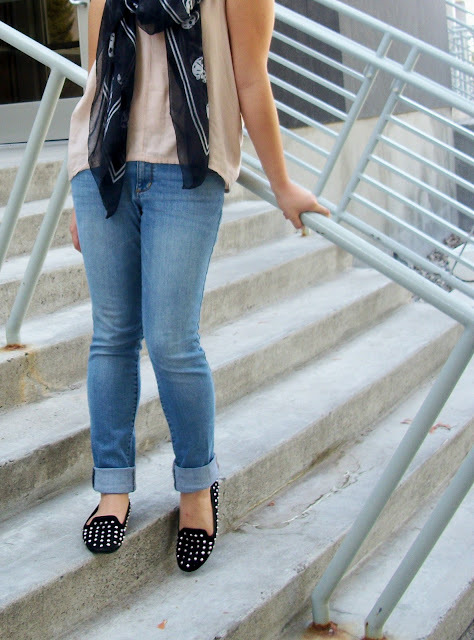 Hi doll, particularly love this look because its very much close to my own style, Love the scarf and shoes. Good luck with the dancing! Cute outfit - LOVE the scarf! Your flats is sooooo awesome!! Your blog is just amazing, I am loving it ! 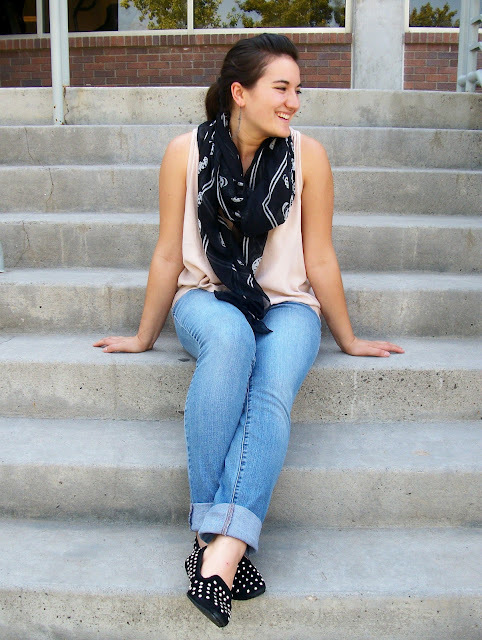 I love how much a scarf pulls an outfit together, and it's such an easy piece!! you look awesome and the give-away is great! we've entered :)! Ah chic and comfy that's the way I like it! 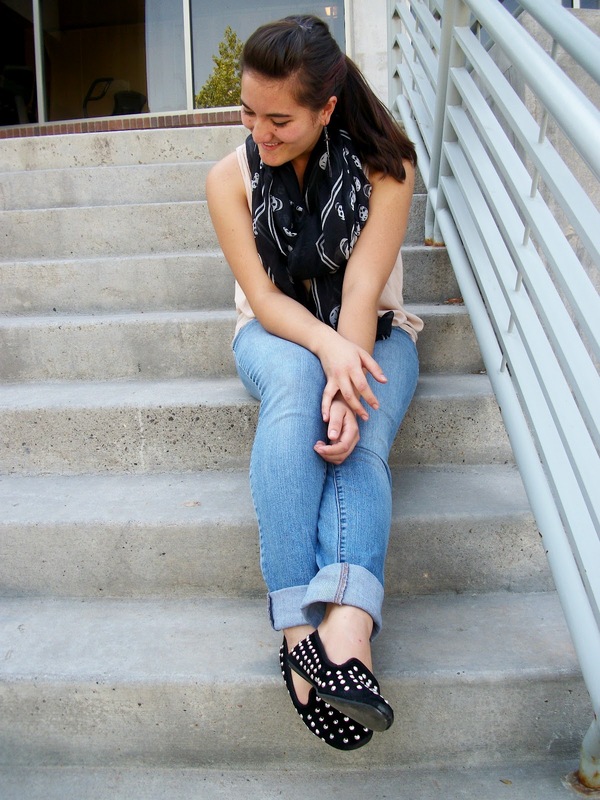 I want your studded shoes!!!!! Cute outfit, I absolutely love your shoes! Loving this casual outfit! Especially the scarf and shoes! 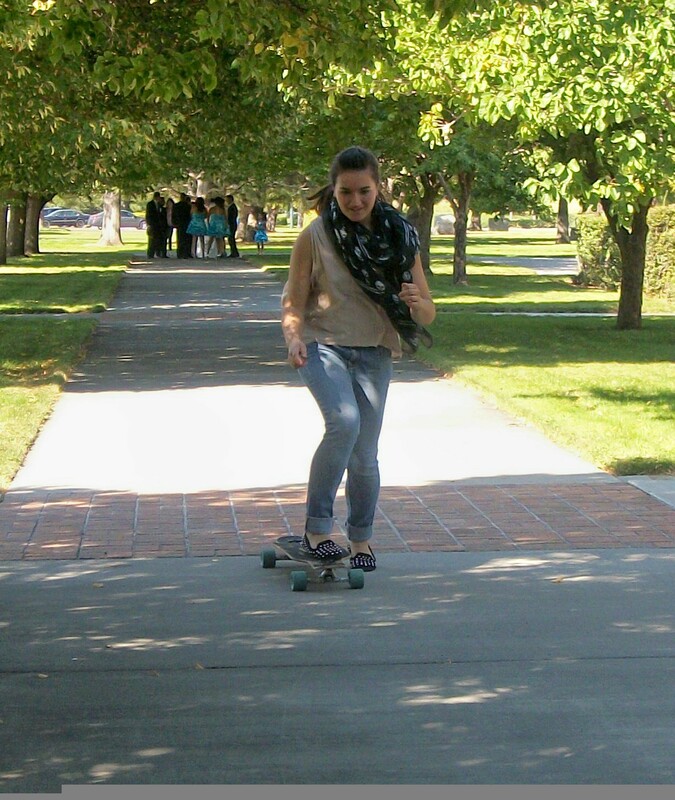 Oh, and my sis wanted to try the longboard stuff but... kinda didn't... ;) It's so nice of P to lend his board to you! Cool! 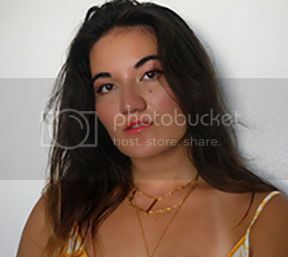 Great look & photos ! :) Nice giveaway. I loe their clothes & stuff ^^ Already followed them before on Pinterest. i love those loafers & that scarf is so cute. looks like a nice campus! Skateboarding fun! Love the scarf! Aren't they the best accessories! Looking amazing and great giveaway and of course I entered. What an amazing give-away! I entered :) Lovely blog you have, you've got a great sense of style! I just entered!I love your outfit! I love your shoes! I think you have a great blog! I'm following you now, it would be great if you followed me back!